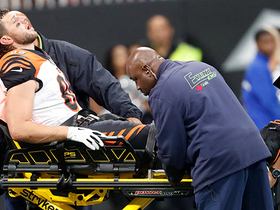 The Bengals placed Eifert (ankle) on injured reserve Friday, Adam Schefter of ESPN reports. Analysis: The transaction was inevitable after Eifert underwent season-ending surgery Monday to address a broken right ankle. The injury is expected to sideline Eifert for 4-to-5 months, suggesting the impending free agent may not be back to full strength by the time teams begin OTAs. While Eifert is out, the Bengals are expected to proceed with C.J. Uzomah and Tyler Kroft as their primary options at tight end. Eifert is expected to require 4-to-5 months of recovery time after undergoing surgery Monday to repair a fractured right ankle, Fletcher Page of The Cincinnati Enquirer reports. Eifert suffered a broken right ankle in Sunday's 37-36 win over the Falcons and will require season-ending surgery, Adam Schefter of ESPN reports. 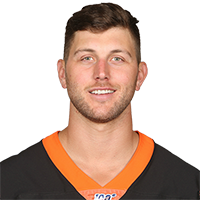 Eifert's right ankle injury from the third quarter of Sunday's win over the Falcons appears to be a season-ending issue, Geoff Hobson of the Bengals' official site reports. 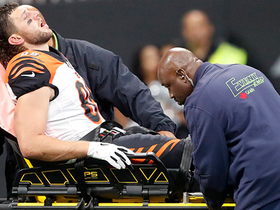 Analysis: Replays of Eifert's gruesome injury leave little doubt that the hard-luck tight end will likely miss extended time. Injured reserve is a distinct possibility for Eifert, with Tyler Kroft and C.J. 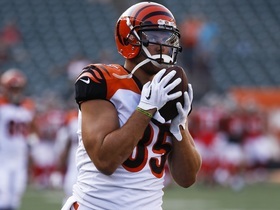 Uzomah now slated to handle the Bengals' tight end duties in the coming weeks. Eifert suffered a leg injury Sunday against the Falcons, Katherine Terrell of ESPN.com reports. Analysis: Per Terrell, the oft-injured pass-catcher's leg looks broken. Assuming that's the case, he'll be in for an extended absence, with Tyler Kroft and C.J. Uzomah next up for the team's tight end looks. Eifert caught six of eight targets for 74 yards and a touchdown in Sunday's 31-21 loss to Carolina. 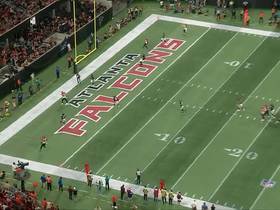 Analysis: Eifert had just five catches for 67 yards combined over the first two weeks, so this was a welcome step in the right direction. Top pass catcher A.J. Green left this contest with a groin injury in the third quarter, which could result in a nice bump in volume for Eifert if Green can't go next week in Atlanta. Eifert secured two of four targets for 23 yards in the Bengals' 34-23 win over the Ravens on Thursday. Eifert caught all three of his targets for 44 yards in Sunday's 34-23, Week 1 win over the Colts. 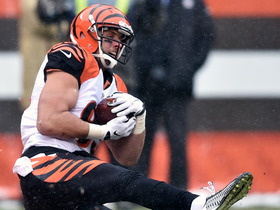 Analysis: Eifert finished fourth on the team in targets behind A.J. Green (eight), Joe Mixon (seven) and Tyler Boyd (five). The tight end made all the plays asked of him, and his physical style should earn Eifert more red-zone looks moving forward. Eifert saw action on 14 snaps in Sunday's preseason win over the Bills. 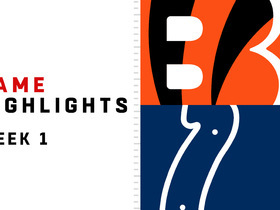 Eifert appears on track to make his preseason debut Sunday against the Bills, the Bengals' official site reports. 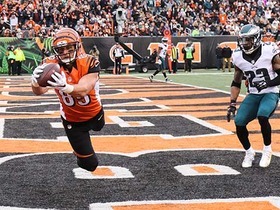 Analysis: Per the report, before the team's last two exhibition contests, coach Marvin Lewis designated Tyler Kroft as the starter at tight end in place of Eifert. Such a move was not noted Sunday, supporting the notion that Eifert will see some snaps against Buffalo. Assuming Eifert avoids any setbacks, he is slated to enter the season as the Bengals' top tight end, though given his injury history, some sort of snap-count limitation seems likely. Eifert was not in uniform for Saturday's 21-13 preseason win over the Cowboys. Analysis: Eifert traveled with the team and worked out with the team's medical staff, but he was ultimately included on the list of inactives for the team's second preseason contest. 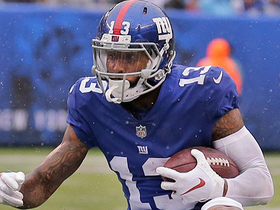 His exclusion from the lineup isn't all that surprising given his injury history, but he should play a part in next week's exhibition against the Bills as he looks to round into form before the regular season starts. When asked about how he would manage Eifert and what would happen if, theoretically, Eifert got to 50 snaps in a game, Bengals coach Marvin Lewis said, "Well, I hope he never gets 50," Katherine Terrell of ESPN.com reports. Analysis: This isn't necessarily confirmation of a snap count on Eifert, and it's the non-responsive type of answer that Lewis is known for. It shouldn't come as a shock that upon that glorious day that Eifert ever plays in a game, he'll likely be limited. Eifert was heavily involved in the Bengals' last two practices, potentially setting himself up for an appearance in Saturday's preseason game at Dallas, Jay Morrison of Cox Media Group reports. Bengals head coach Marvin Lewis refused to answer whether Eifert (back) would play in the Bengals' first preseason game Thursday, but he was on the field earlier in the day getting in some work, Jim Owczarski of The Cincinnati Enquirer reports. Analysis: It's not terribly important that Eifert play Thursday night, only that he doesn't experience any setbacks in the course of ramping up his activity. Even if he plays, like most starters he'll be limited. Eifert (back) took part in Monday's padded practice, but he was limited to individual work Tuesday, Jim Owczarski of The Cincinnati Enquirer reports. 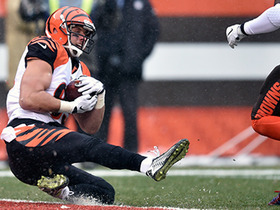 Eifert (back) practiced without restrictions Friday, Katherine Terrell of ESPN.com reports. Eifert (back) sat out the Bengals' full practice Thursday, instead working out on the side, Jay Morrison of the Dayton Daily News reports. Analysis: The Bengals are breaking Eifert in slowly, which makes sense given his extensive injury history. It explains why he began training camp on the PUP list, and why he didn't practice Thursday. He's also unlikely to participate in Saturday's scrimmage. Eifert (back) passed a physical and is expected to practice Monday, Paul Dehner Jr. of The Cincinnati Enquirer reports. Eifert (back) has no doubt he will be ready for Week 1, Paul Dehner of The Cincinnati Enquirer reports. "There is no setback," Eifert said. "I'm feeling good. This is just the route we chose to take." Eifert (back) has been placed on the Physically Unable to Perform list, Katherine Terrell of ESPN.com reports. Eifert (back) is expected to open training camp on the Physically Unable to Perform list, Ian Rapoport of NFL Network reports. Bengals director of player personnel Duke Tobin expressed some uncertainty whether Eifert (back) would be a factor this fall, Geoff Hobson of the Bengals' official site reports. "Hopefully Tyler Eifert can come back and be a factor for us," Tobin said. "I can't predict the future on that one, but I can testify to the fact that he made a difference when he was up and running for us. We know what he can do if he can get back to that level. I know his full intent is to get back to that level. We'll see if he can." Analysis: Hobson shared Tobin's skepticism, stating that it would be a surprise if Eifert is practicing when camp opens Thursday. 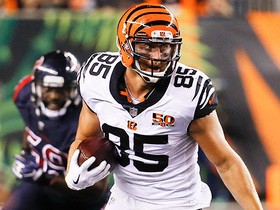 The tight end's health concerns are well documented at this point, but the imposing threat he provides in the red zone when available provided enough reason for the Bengals to bring him back on a one-year deal this offseason. Eifert (back) tweeted Monday that he's looking forward to the grind of training camp. Head coach Marvin Lewis said Eifert (back) hasn't suffered any setbacks, but he's unsure what his availability will be for the start of training camp, Jay Morrison of the Dayton Daily News reports. "When (the doctors and trainers) tell him or release him to do what we can do, then he'll be ready to go," Lewis said when asked if Eifert would be ready for training camp. "The main thing is for him to stay up with everything mentally and when he can get the reps he can get that he was getting before when there wasn't defense over there it was good. There's no reason to get him jostled around right now until the time comes." Eifert (back) did not participate in the first day of the Bengals' mandatory minicamp on Tuesday, Geoff Hobson of the Bengals' official site reports. Analysis: The exact reasoning for Eifert's absence is rather unclear after the tight end was a limited participant in OTAs, but head coach Marvin Lewis suggested that it was health-related, as that is the only reason why a player would be absent from minicamp. Whether Eifert aggravated an injury is still to be determined, but the Bengals should have an official update on his status at some point this week if he remains sidelined. Eifert (back) didn't take part in 11-on-11 work during the first round of OTAs, Jim Owczarski of The Cincinnati Enquirer reports. "I feel good. I'm on schedule," Eifert said. "This has been part of the plan to stay monitored as we progress through here. I don't want to go out there and have any setbacks or anything, so just methodically moving forward. The plan is to go into camp full speed but there's nothing keeping me back from doing that right now." Eifert recently indicated that he still isn't allowed to squat or perform exercises that "load the spine," Jim Owczarski of Cincinnati.com reports. "It's important to stay healthy whether you've been hurt or not, but I think I'm obviously in a unique situation with the amount of games I've missed," the tight end said. "I'm doing everything I can as far as maintenance goes and all that stuff so I can stay on the field -- just doing what I can." Eifert can earn $8.5 million in 2018 if he catches 65 or more passes for 650 or more yards and eight or more touchdowns, Jim Owczarski of The Cincinnati Enquirer reports. Eifert has signed a one-year deal to remain with the Bengals, the Cincinnati Enquirer reports. Eifert (back) confirmed he is back to full health as he prepares to hit the open market in free agency, Jim Owczarski of The Cincinnati Enquirer reports. Cleared to play, but where? Eifert, who was only able to play in two games prior to undergoing micro-disc surgery last season, was cleared last week by Dr. Robert Watkins to participate in OTAs this spring and play in 2018, Adam Schefter of ESPN reports.